Since I was also attending Sugarrae‘s SEO Training, I was up at 2:45 to leave Buffalo and fly into New York (JFK). People are always surprised that I don’t drive, but New York is a wide state. It would take 6-1/2 hours to drive, then I’d have to deal with where to put the car. Flying into JFK takes 50-55 minutes, which is the same time it takes to get from JFK to Manhattan via the trains. Sidebar: If you fly into JFK, taking the trains into Manhattan is really easy. Get on the AirTrain and take it to Jamaica. Then buy a Metro Card (make sure you get an AirTrain + MTA card. $20 should be good, and you get a little bonus), pay for your AirTrain ride ($5) then walk over to grab the E train towards World Trade Center ($2.25). Get off at 7th Ave, and you’ll be just 1 block from the Hilton. Of course, the E line was under construction, so they moved us to F, but I still figured out how to get to the Hilton. It was too early to register, but the Hilton has a bag check so I dropped off my luggage and went into the SEO training, with 7 minutes to spare, or 53 minutes late, depending who you ask. 🙂 A full review of Sugarrae’s SEO training will be posted soon. After the SEO training, I found my roomie, Mike Buechele, checked in, then heard Jason had arrived so met him for a drink before getting ready for the Buy.at party. Buy.at’s parties are very classy and rather exclusive. Not like I’m better than you exclusive, but they don’t have an open door policy, so it’s a smaller group of primarily veteran CPS affiliates. I’ll get into CPA vs. CPS soon when I cover that session. Since I was up nearly 20 hours, after Buy.at I was done and went to bed. Sunday morning I got up & scrambled to get to St. Patrick’s for 9am mass. Tip: If you want to sit near the center isle, don’t think you can go down a side isle and slide down. There’s railings that try to stop you. Then again, if you have no dignity, you can crawl under them, as Ashleigh and I did. Whew! Lots of sessions for 1 day! I then ran over to the Opening Remarks and Keynote with Marc Ostrofsky author of Get Rich Click! I admit, already the book title Get Rich Click! turned me off. My plan was to see if Jim Kukral had any show announcements, then maybe stay for Marc. However, Jim didn’t have any announcements and started up a video, which played the Black Eyed Peas, I’ve got a feeling and some clips of The View, talking about how Marc is in the Guiness Book of World Records for selling a domain name. That was enough for me, and I left. Based on the tweets during the Keynote, I didn’t miss much. Anyone have something to share from it? Please leave a comment. Still on Sunday, I went to the Newcomer Meetup (where my newcomer didn’t show up – hope he wasn’t fired like the last two I had) then for some Famous Original Ray’s Pizza, and finally the ShareASale Barn Dance. It’s a lot harder than it looks, and my legs were sore for 2 days afterward! Once the barn dance turned into a techno nightclub, I went to bed. At 8am I was hosting an open Whiteboarding session (which does NOT mean we’re sitting around smoking pot, as some people thought whiteboarding was) and was all set with my key to the blogger’s room. But it wasn’t the right key! Panic! Luckily, we got into the room on time, but on day 1 I couldn’t get my laptop to work with the projector (I was a bit frazzled after the padlock problem). Still, it was standing room only. After breakfast, I hit up the Keynote featuring Wil Reynolds. (I’ll expand this soon). After the regular sessions, there were some roundtable discussions and I headed over to hear Robert Adler talk about Link building. He needs his own session, as the people were packed around his table three-deep. Monday night a small group of us headed to Churrascaria Riodizio for an amazing Brazilian steakhouse-style dinner. (According to us, Yucca is a cross between a cactus and a potato). Sidebar: we were going to take a taxi / van there (it’s about $20) but there were none in line at the Hilton. A limo driver offered to take us for $50, but instead we braved the subway again. Took the E line to Canal Street, walked 2-1/2 blocks and we were there. When in New York, act like a New Yorker and try the subways. They’re easy to use, once you try it! Since I was whiteboarding again at 8am, I left and was in bed by 12:30. Then stared at the ceiling until 2:30, and was wide awake at 6. Who needs sleep, anyway? After Affiliate Summit was over, a few of us went to the Yankee’s vs. A’s game. Thanks to Shawn & Missy for the invite! It wasn’t too exciting of a game until the 8th, when the Yankee’s started playing. Unfortunately, they couldn’t pull it out in the end (#twss) and ended up losing. Wednesday was a travel day for me, and hopefully marks the last time I fly anywhere between Chicago and Boston. It’s all Amtrak for me from now on. Trains are so much more comfortable and easy to use, while flying is getting more and more cramped and difficult to manage (more on riding Amtrak). I need my readers who attended my whiteboarding sessions to do me a favor, and leave feedback (good and bad) to either realdeal-at-affiliatesummit.com or @affiliatesummit on Twitter. You can copy me only if you want. Since it wasn’t a regular session, there were not feedback forms, but attendee feedback is how the show keeps getting better every year. 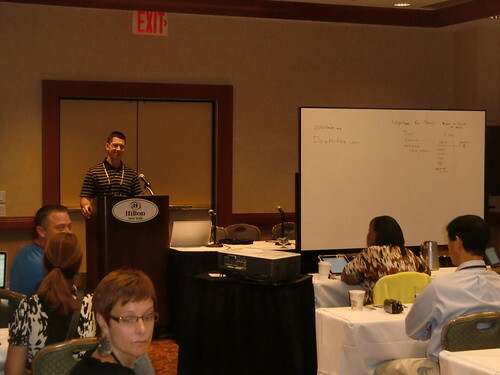 It’s fun to read your detailed experience at Affiliate Summit. Clearly the people liked the whiteboarding, so if you’re interested in doing it again in Las Vegas, we’d love to have you back. And we’ll get door lock and A/V issues ironed out. Hey, I see my back on last the picture 🙂 In case any future affiliates/merchants read this page DO NOT MISS Eric Nagel’s white-boarding. Hearing real affiliates’ feedback about merchant sites ( & vice versa) was priceless. Imho, for more visibility your session should be listed with other Breakout Sessions & on ase11(dot)sched(dot)org. I almost missed it.